Can't keep it ALL to myself. So this is going to be short and sweet.. Oh so sweet! I’m not really in the post writing frame of mind, might have something to do with the miniature albeit seemingly grand rock concert that’s been playing out in my head since about 2pm this afternoon. You know one of those shockers that has your squinting at the computer screen and wanting to sit in absolute silence with a lavender swab splayed over your face. Yeah, that’s happening. 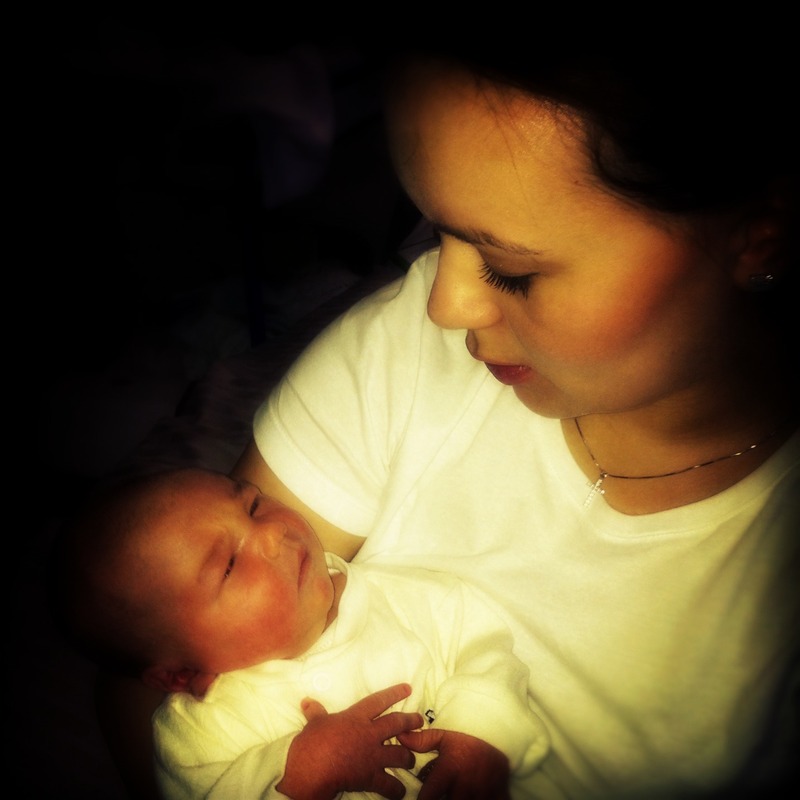 But I did have to share just one picture of my beautiful friend and her most angelic new little boy. N.M.R. who was born Friday morning and is just divine, he is the epitome of pure sweetness. Just simply being in the presence of someone so new, someone so small and fragile and innocent was completely overwhelming, but in a good way. I can not wait to be a part of his introduction into this crazy beautiful world. To see him grow and shine and be as awesome as his mother and father and older brother all rolled into one, that’s going to be something. He is going to one fabulous little guy. There is nothing so amazing as to watch my friend with her little boy, I could sit and watch them forever. The love, the awe, the bond that has been blossoming over 9 months and then he is here, in her arms and she doesn’t even have to utter one word to express how in complete and utter love she is. If nothing ever warms your heart, this vision should. This entry was posted in Life and tagged baby, birth, life, love, mothers by Meagan. Bookmark the permalink. What an amazingly beautiful photo! How exciting for you, he is finally here! The photo is gorgeous. You will be a fabulous ‘Aunt’ I am sure. How did you go with choosing sizes for gifts? I know he is finally here!!! So I took back the 0000’s and got all 000’s, he is small but will soon be in 000’s. I might have gone a bit OTT but I am allowed!!! That is such a lovely post about your friend, she is lucky to have someone like you to share this moment. Thanks Eva – But I do think I am the lucky one!